Are you looking to create a lighter, brighter kitchen? 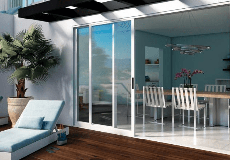 Windows and patio doors can help you in the process. Many homeowners find that their kitchen is the heart of their home. It’s where people gather for parties as well as mealtimes. The addition of windows can elevate the look of your kitchen as well as bring in more natural light for a warm, inviting space. Here are 5 ideas to get you started. What if you might have some room for windows, but not much? Try adding narrow windows tucked between upper cabinets and shelves to bring much needed natural light into your kitchen area. This can provide natural lighting to any kitchen space. See how the light enters the room from both artificial and natural lighting? Instead of replacing your upper kitchen cabinets with windows. Consider adding a window backsplash below the cabinets to let in more natural light. While under counter lighting helps eliminate dark spaces beneath cabinets, natural light during daylight hours is even more beneficial and beautiful. No room under the cabinets? No problem. Introducing clerestory windows. These windows are found in the upper part of a high-ceiling room. Where upper cabinets and shelves can seem a higher priority than natural lighting you can place a clerestory windows above the cabinet or shelves, with a minimal loss of storage space. Here we have an example of using clerestory windows in the dining room. See how they add natural light into the space and don't take up much room? Stacking windows also add light into the room and can be a great focal point, if done correctly. This collection of windows includes awning and casement windows that are stacked to provide maximum natural lighting into the kitchen. A gable end is the triangle formed by a sloping roof (See imagery below) This area of a home can often be underused and sometimes left barren.By adding a window to the gable end it is an excellent space to use to provide extra daylight. Garden windows are designed to let in light, create a healthy environment for plants, and make even grey, cloudy days seem filled with spring. Garden windows extend out from the house and generally have an interior shelf for plants and herbs. Side vents provide ventilation for fresh air. This is also a great option if you don't like having plants on a window sill in fear of having to move them to open the window or worse, having them fall into the sink when trying to maneuver around them. If you are interested in garden windows make sure to place them away from sidewalks, patios or other exterior features because the window extends beyond the house. Which of these ideas are you planning to use in your home? Comment below on your favorite. Kitchens are an important room to keep light because we spend so much time in them everyday, and you don't want to feel trapped in them. By bringing in light it makes you feel like you are connected to the outdoors and part of the outdoors. A lot of these are things I would love to do if I owned my own home. I would love to have a window to set plants into that jets out from the house. I like the idea of windows between the cabinets. This could be a good solution for us as we remodel our home. I like your idea about stacking windows. It makes sense that it can be a great focal point! My kitchen has always been small and dim. To make it worse, there is old wallpaper in some spots! It just doesn't look good. Getting my kitchen remodeled would be a dream.